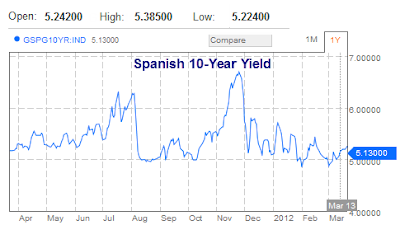 Spanish Sovereign debt yields jumped again today following Restructuring Concerns expressed by Willem Buiter. Spanish bonds fell, pushing 10-year yields to the highest level in a month, after Citigroup Inc. chief economist Willem Buiter said the nation faced an increasing risk of a debt restructuring. Ten-year Spanish securities slid for an eighth day, widening the extra yield over similar-maturity German bunds, as a decline in European stocks sapped demand for higher-yielding assets. The Spanish 10-year yield jumped 14 basis points, or 0.14 percentage point, to 5.37 percent at 2:55 p.m. London time after rising to 5.38 percent, the highest since Feb. 16. The extra yield investors demand to hold Dutch bonds instead of German bunds widened after an independent agency said the Netherland’s budget deficit may increase. The Netherlands Bureau for Economic Policy Analysis said the shortfall would exceed the European Union’s target of 3 percent. The agency said the 2013 deficit would be 4.6 percent, revised from 4.5 percent. Willem Buiter is a bit too politically correct. I suggest the odds of a Spanish Debt restructuring is greater than 90%.